Attacks on white South African farmers skyrocketed by 25 percent in 2018, with assailants using electric drills, blowtorches and bleach against some victims, according to a report released by the Afriforum group, which champions the rights of the country's Afrikaner minority. Afriforum spokesman Ernst Roets pointed to a "racial element" in the attacks, saying that the number of murders had ebbed to 54 from 72 in 2017, in a sign that the white farmers had tried to fend off their attackers. "More victims are shooting back, more are being trained and more are defending themselves. They are not allowing themselves to be victims. The farmers aren't waiting to get murdered, but rather prepared for that contact to happen", Roets noted. He added that a total of 433 incidents had taken place last year, up from 342 in 2017 and the highest figure recorded by the Afriforum group. He described the developments as a "serious crisis", which he predicted is "only going to get worse". Roets specifically pointed out the "disproportionate" nature of the farm attacks in South Africa, which have nothing to do with domestic robberies and which "are deserving of special attention". "We don't need foreign governments to solve our problems, we just need their help in putting pressure on our own government. The police and government are just not doing enough, they are very lackadaisical", he concluded. Roets' remarks come after reports in December that white farmers in South Africa could be forced to give up their own homes in line with the constitutional go-ahead for land expropriation without compensation later this year. Earlier, the country's parliament approved the establishment of a committee which is due to hammer out a legal amendment to Section 25 of South Africa's constitution. In August, South African President Cyril Ramaphosa pledged that the country's ruling African National Congress will "finalise a proposed amendment" to the constitution in a measure which he described as "critically important" to the country's economy. 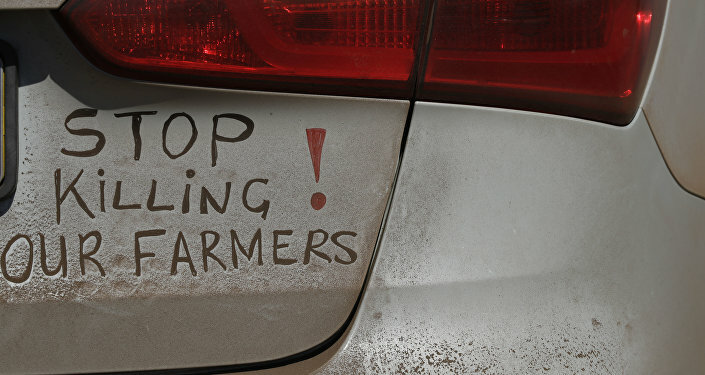 In March, The Independent reported that South Africa's white farmers were being targeted in a growing spate of "brutal" attacks and that at least one white South African farmer dies every five days in these assaults. Right now, 73 percent of agricultural estates in South Africa still belong to white farmers, who make up 10 percent of the country's population.